This post is a continuation of the previous Updated Installing Apache, Lizmap Web Client, and QGIS on Windows OS blog post. You need to have a GIS server set up first that uses the Lizmap Web Client. Then you use the Lizmap plugin in QGIS Desktop to help you publish the QGIS project as a web app to your GIS server. For this tutorial, I assume you already have QGIS Desktop installed. I have both QGIS Desktop LTR 2.18.21 and 3.2 installed on my computer but for this tutorial I am using the LTR 2.18.21 version – as that is the version of my QGIS Server and that my Lizmap Web Client is using. The Lizmap plugin will also work on QGIS desktop 3.2 but is listed as “experimental” so I take it that it hasn’t been fully tested yet(?). For this tutorial, I assume you already know the basics of using QGIS Desktop. This part is optional but highly recommended for organizational purposes. Create a working project directory. For my set up I create a batch file (*.bat) to create my folders. You can of course also create your folder and subfolders manually. Because I have everything (QGIS Server, Lizmap Web Client, and QGIS desktop) all on my laptop for testing, I’m just going to put my webapp folder inside my webserver directory - most likely in reality your GIS Server would be on a separate server. Your folder structure can be whatever fits your needs. 1. I use a batch file to make my folders. You can create a batch file in a text editor (such as NotePad or NotePad++) to create these folders. Below is an example of my folders. 2. Save your *.bat file (e.g. createDir.bat) and then run it in the Command Prompt window. Here is a look at my sample project. General Tab: Use option Save Paths = relative ; fill or select other parameter option as you choose. In the Lizmap window: There are many options and parameters. You can choose whatever you like. Baselayers tab options: input basemap layer options. Locate by layer tab options: Here I am adding the Tax Map Parcel (TMK) layer, so I can search by TMK number. Attribute table tab: Again here I am adding in the Tax Map Parcel layer so it's attribute table will be shown. 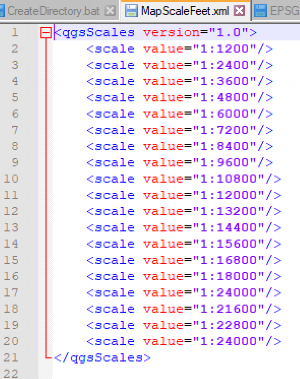 That's just some of the basic configuration set up I'm using for this example. After you are done with your set up, click Apply then Close. Also don't forget to save your QGIS project as well. After you apply and save the Lizmap configuration a configuration file (*.qgs.cfg) will be written with the same name of your project. Save your QGIS Project, and if you're happy with everything, then you can copy the project from your preproduction environmental to production for Lizmap web client to consume. For me that means copying everything from ../preprod/maprep to ../prod/maprep. If you want a custom thumbnail image to be displayed for your web app in the Lizmap web client view PROJECTS page, you can do so by taking an image and naming it with *.qgs.png file extension. Note in my example, I have a *.qgs.png image with same name as my QGIS project, which is really a snapshot of my QGIS map canvas. This image (*.qgs.png) will be used as the thumbnail image of my project web app. The default image for a web project in Lizmap is a black and white world map. You must include the .qgs file extension to your filename and saved in the same location as your *.qgs.cfg and *.qgs files - like this example. 3. In the Lizmap Configuration tab: Create a New Repository. You can also remove the default demo and intranet projects if you'd like. Local Folder Path: path to your QGIS project (e.g. /webserver/webapp/prod/maprep/). Do not include Drive letter or use back slashes in your path. 3. Optional - Theme settings: Go into the Theme settings and Modify options if you want for your web app. 4. Go to the PROJECTS page (button in top right) and you should see your projects. Note you can have more than 1 projects in your repository - I have 2 projects in mine. Here's what my web map example looks like. That's basically it for a basic configuration and publishing of QGIS project to Lizmap web client. You'll notice in my web app that I have added a google-satellite basemap and an overview map - these are advance configurations which are explained below. To add an overview map to your web app, you just add a group layer in QGIS with the named "Overview" (without quotes) - this will indicate to Lizmap web client to use it as the overview map. Then add your data layers to the group - in my example, I'm only using a stamen-toner web service in my overview map. The first way is quick and easy way - you just check the basemap options (e.g. Google, OpenStreetmap, Bing, IGN (France) in Baselayers tab in the Lizmap plugin configuration window. 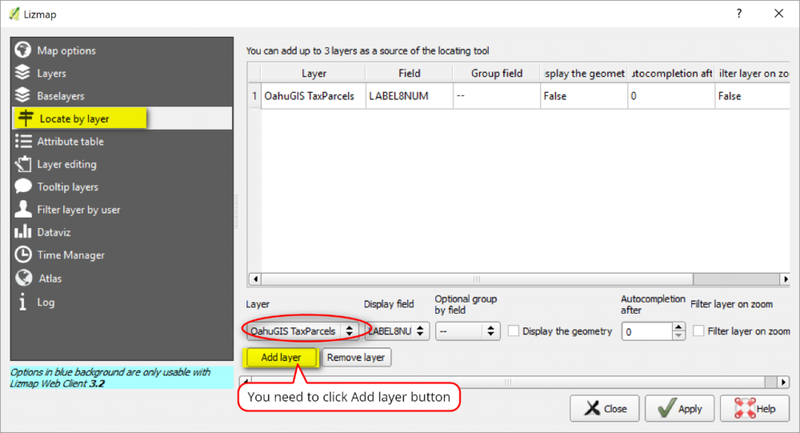 However, adding basemaps via the Baselayers tab will not print as these basemaps are external to your QGIS project - see https://docs.3liz.com/en/publish/advanced_lizmap_config.html#allow-printing-of-external-baselayers. To work around this, you need to add the basemap(s) as a group or layer in QGIS whose name is part of the following list - these corresponds with the external basemaps in the Baselayers tab of Lizmap plugin. NOTE: Remember you still have to be in compliance with the licensing terms of all the basemaps you use. Below is the options I used in my example - also see snapshot. In QGIS, I used the QuickMapServices plugin to add in these basemaps: Google Satellite, Open Topo Map, and ESRI Topo. For google-satellite, OpenTopoMap, and ESRITopo, check base layer? option (these are not part of the default Lizmap baselayers and I want to use them as Basemaps). Also check option for use Single Tile? For hidden groupings: No need to check option to use as base layers since these are hidden anyway and will only be used for printing purpose. Also these are already part of the default lizmap baselayers options and you don't want duplicate basemaps in your web app. 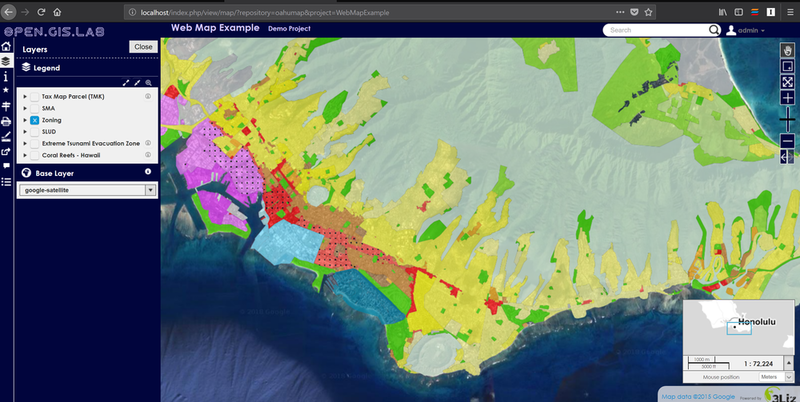 Printing basempas in your web app via the Lizmap web client viewer is a bit tricky. 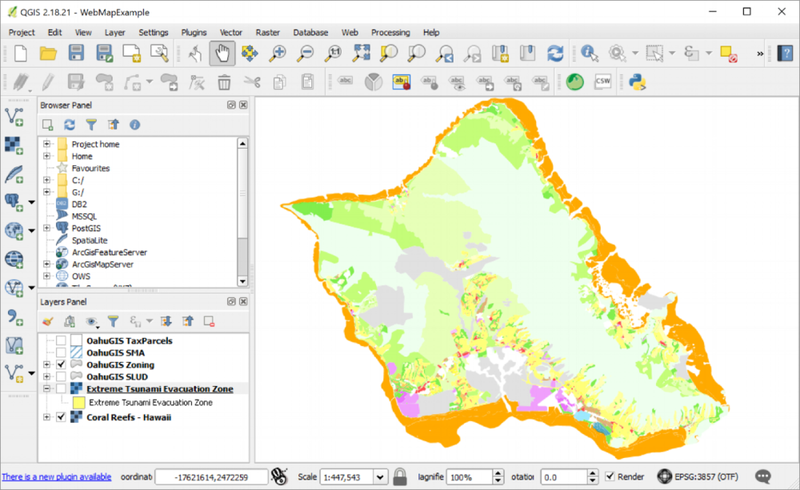 First you need to have a print composition in your QGIS project and it needs to have at least 1 map in it and you also need to enable the printing function in Map options tab of the Lizmap plugin configuration window. Printing basemaps in Lizmap may not always work. One big caveat is, you cannot have text labels in your print composition - otherwise you will get an "Internal Server Error" and your map will not print. It seems to me that the printing of basemaps can sometimes be finicky. I've gotten errors even after I've removed text labels in my print compositions - something about the basemap layer not being found or define (e.g. Layer "osm-mapnik" not found). What I did for this error was to clear my cache and log off and log back into my Lizmap Administration page - this worked for me. I'm not sure if printing basemap issues are from Lizmap's end or QGIS Server. I've seen on some forums, suggestions for installing a fake X server but that's for Linux and/or Mac OS - I don't think that's an option for Windows OS. This makes me think it's a QGIS Server issue, but I don't know. By the way, printing of basemaps in the QGIS project works fine - it's just the printing in the web app that can be a problem. Here's an example of my print composition. It is a simple A4 landscape layout. Create your print compositions and save your project, then in the web app you can select the layout to use as template for printing. Here's an example of the printing function in my web app. Using the print function is pretty self explanatory. Here are some snapshots of print pdf maps with each of the different basemaps selected for printing in my web app. Ok, so that's it for this tutorial. Thanks for reading!